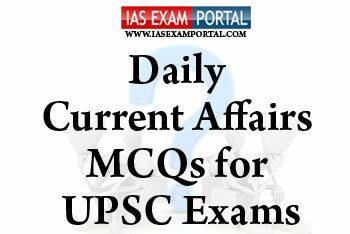 Current Affairs MCQ for UPSC Exams - 10 October 2018 | IAS EXAM PORTAL - India's Largest Community for UPSC Exam Aspirants. Q1. Which of the following statements regarding cyclones are not true ? 1) A cyclone is an area of winds blowing in a circular motion, usually centred on an area of high pressure. 2) They circle clockwise in the southern hemisphere, and anti-clockwise in the northern hemisphere. 3) In parts of Asia and the South China Sea, cyclones are called typhoons. Like hurricanes, they are named and are often given a name in the local language, based on where they formed. Q2. Which of the following statements regarding representation of people act 1951 are true ? 1) Section 151A of the Representation of the People Act, 1951 mandates the Election Commission to fill the casual vacancies in the Houses of Parliament and State Legislatures through bye elections within six months from the date of occurrence of the vacancy. 2) The act also deals with details like qualification and disqualification of members of both houses of Parliament only. 3) the prohibition of public meetings 48 hours prior to the conclusion of polls, besides other offences, are covered by the Representation of People Act, 1951. Q3. Which of the following are the consequences of forest fires ? 1) Forest fires increase carbon dioxide levels in the atmosphere, contributing to the greenhouse effect and climate change. 2) ashes destroy much of the nutrients and erode the soil, causing flooding and landslides. 3) chemicals contained in “flame retardants” used to extinguish fires (such as Fire-Trol) accumulate in the soil for years they are known to alter soil fertility, biodiversity and affect the composition of vegetation. Q4. 1) These are generally located on the western coasts of continents, between roughly 30 and 45 degrees north and south of the equator, typically between oceanic climates towards the poles. 2) The climate is an intermediate type between these other climates, with winters somewhat mimicking winters in oceanic climates and summers imitating sunny weather in semi-arid and arid climates. 3) The natural wildlife found here include goats and sheep. Rabbits, jackels, and lynx can also be found here.